You can download it from Rapidshare.de or Rapidshare.com. 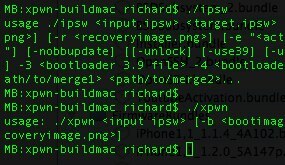 First create a custom IPSW using the IPSW Builder (original is iPhone1,2_2.0_5A347_Restore.ipsw). Once you have pwned Itunes, put your phone into DFU mode. If you don't know how to do this click Here. Once you are in DFU mode Itunes will pop up and then you can hold shift and click restore and browse to your custom IPSW file. 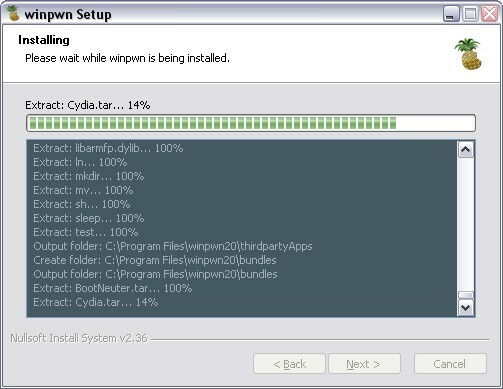 Remove Winpwn 1.0 completely if you have it installed. Installing over the top of WinPwn 1.0 will cause problems. Investment bank Piper Jaffray said Tuesday it believes Apple is readying new iPod and notebook products that will apply downward pressure to profit margins because they'll be priced more affordably, such as 13-inch MacBook that will fetch less than $1000. "We believe there is an 80% chance Apple will introduce redesigned MacBooks and possibly new MacBook Pros at lower price points," he wrote. 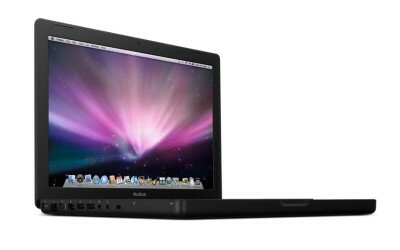 "Specifically, Apple may re-enter the $999 price point (currently $1099) with the MacBook, or test the $1,799 price point with the MacBook Pro (currently $1999)." The Piper Jaffray analyst reiterated his Buy rating and $250 price target on shares of Apple. The development sources for xpwn 0.3, the firmware 2.0 version of our cross-platform jailbreaking library/command-line utility have been pushed onto github. DevTeam tested it on Linux, Windows XP, and Windows Vista for both the iPhone 2G and iPhone 3G thus far, but since it uses the same FirmwareBundles files as PwnageTool, and we know those work for the iPod touch, there ought not be any problems. Being a suite of command-line utilities, this release is meant primarily for developers. While you can certainly jailbreak (both 3G and first-gen) and unlock (first-gen) with it, it's not really something you want to try without reading the lengthy, detailed README. If you don't have the patience to do that, this release is not for you. For users this news mean that quite soon there will be a new version of winpwn, supporting 2.0. There is not much defference between Safari 1.1.4 and 2.0. But Under the hood, MobileSafari 2.0's performance is hugely improved over 1.1.4. Everything related to web surfing feels faster, web pages consistently load faster on 2.0, both via Wi-Fi and EDGE. This has nothing to do with the new iPhone 3G hardware — this is about dramatic performance improvements on original iPhones upgraded to the 2.0 OS. The last column shows how many times faster the 2.0 version of MobileSafari was versus 1.0.1 and 1.1.4. The same results, charted (smaller bars are faster) can be viewed above. For all the hubbub regarding the new App Store, most “iPhone software” runs in the web browser. But improvements in WebKit performance often help native iPhone app performance, too — a slew of my favorite native iPhone apps have built-in WebKit browsers (e.g., NetNewsWire, Twitterrific, Instapaper, and Cocktails). 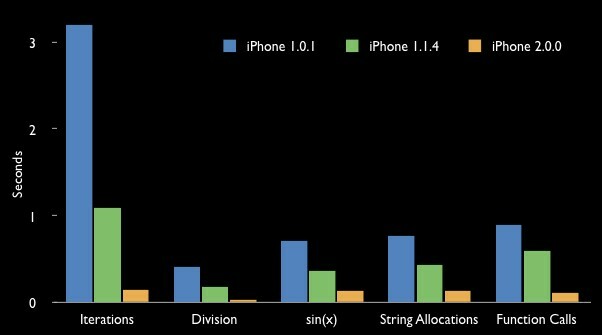 When WebKit performance improves, any app that uses WebKit improves, and WebKit improved a lot between iPhone 1.1.4 and 2.0.0. The results are 31 seconds with IPhone 3G and 53 seconds with old IPhone (EDGE). Quite impressive. PS: By the way. They said "I'm done" a bit slow. Progress bars were done in 29 and 49 seconds correspondingly. The battery life on Apple's new 3G iPhone isn't great, but it beats that of other 3G smartphones we've seen, say testers at PC World's Test Center. In the study's standard talk-time battery life test, an iPhone, on average, ran 5 hours and 38 minutes, a performance PC World deems "fair." The original iPhone, which ran on AT&T's slower EDGE network, lasted 10 hours of our test. But the 3G iPhone beat out the rest of the current 3G smartphone pack, most of which fell shy of the five-hour mark that's the cutoff between a word score of fair and poor in PC World's performance ratings. 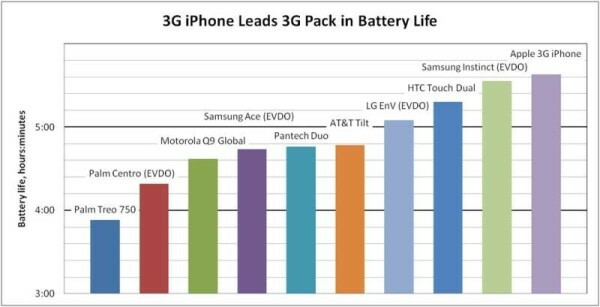 The iPhone 3G also beat out competitors on Sprint and Verizon's EVDO mobile broadband networks, including the Palm Centro (4:19) and the Samsung Instinct (5:33), PC World says. Larry Meyer from AT&T testdrives GPS functionality on IPhone 3G. There was an application called Apollo IM. It worked, but didn't work good - it hanged, dropeed connections, exited for no reason. 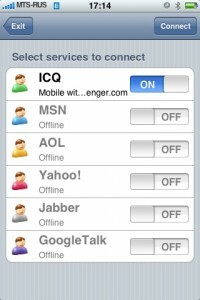 Later there was MobileChat, which version 2.23-2 was much better than Apollo. It did work. 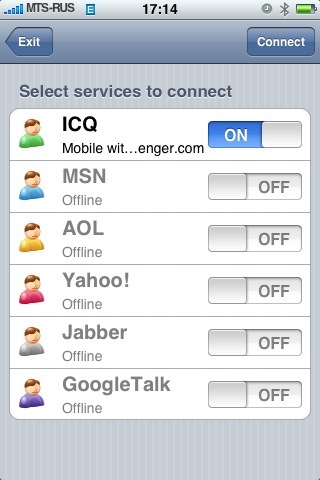 It leasе I used it with ICQ many times. However it didn't have history and there were some problems with offline cyrillic messages. Now there is AgileMessenger. It is quite popular, because it supports many phones (not just smartphones). Now it is avaliable for IPhone. The interface is good. Users can chat, send pictures, there is history. And history is saved even when you restart an application. There is even a traffic meter. This is a tutorial, that shows step by step how to use installed Java on the IPhone. Just in case you do not have Java installed on your IPhone there is a tutorial how to do it. What we need is a working jailbraked IPhone with Java Installed. I used latest firmware 1.1.4, unlocked, jailbreaked and customized by winpwn. Step 1: Create simple Java application, compile and run. This is a tutorial, that shows step by step how to install Java on the IPhone. What we need is a working unlocked and jailbraked IPhone with Installer. I used latest firmware 1.1.4, unlocked, jailbreaked and customized by winpwn. So let's start, because it's worth it! It's just one evening and you will be able to create your personal Java application, compile and run it on the IPhone, and amaze all your friends . JamVM is a new Java Virtual Machine which conforms to the JVM specification version 2 (blue book). In comparison to most other VM's (free and commercial) it is extremely small, with a stripped executable on PowerPC of only ~200K, and Intel 180K. However, unlike other small VMs (e.g. KVM) it is designed to support the full specification, and includes support for object finalisation, Soft/Weak/Phantom References, class-unloading, the Java Native Interface (JNI) and the Reflection API.JamVM currently only includes an interpreter (keeps it small). However, the interpreter is highly optimised, and performance is on par with a simple JIT. As most of the code is written in C it is easy to port to new architectures. JavaOne is one of the most interesting events in IT industry. We are expecting a lot of talks about Java and other technologies. One IPhone+Java - related talk was already mentioned at Java4IPhone.com (link). There are couple more of them. The objective of the phoneME project is to further expand the usage of Java™ Platform, Micro Edition (Java ME platform) technology in the mobile handset market. The goal in making these technologies available to the Mobile & Embedded Community is to reduce implementation variation, increase the rate of innovation and enable new devices to leverage the power of the Java ME platform. Session Title: "How to Port phoneME™ Advanced Software to Google Android, iPhone, OpenMoko, LiMO, and More". Session Abstract: "This presentation discusses how to port phoneME™ Advanced open source mobile platform software to the latest hot cell phone and embedded device environments such as Google-OHA, Android SDK, iPhone/iPod (touch) SDK, OpenMoko, and LiMO. The objective of the phoneME project is to further expand the use of the Java™ Platform, Micro Edition (Java ME platform) in the mobile handset market through open source. The project scope includes a focus on the emerging next-generation phone segment with the phoneME Advanced software stack. This session concentrates on how to use the open-source phoneME Advanced project as the core Java virtual machine and libraries to enable the most-recent popular mobile development platforms to become Java technology-enabled. " Make sure to attend this event and this sesson in particular. Hinkmond Wong is an expert from Sun Microsystems, who can answer many questions about IPhone, Java and more.